On this day, I hope that everyone has a chance to reflect on good memories of the men who made us who we are, both the fathers still here and those that now live in the hearts of their children. The photo above was taken by the U.S. Navy in early 1968. In my 5-year-old hand, I hold the Bronze Star awarded to my father during his 1967 tour in Vietnam. William E. Wynne Sr. turns 88 today. Above, My Father as a 17 year old enlisted man in WWII. 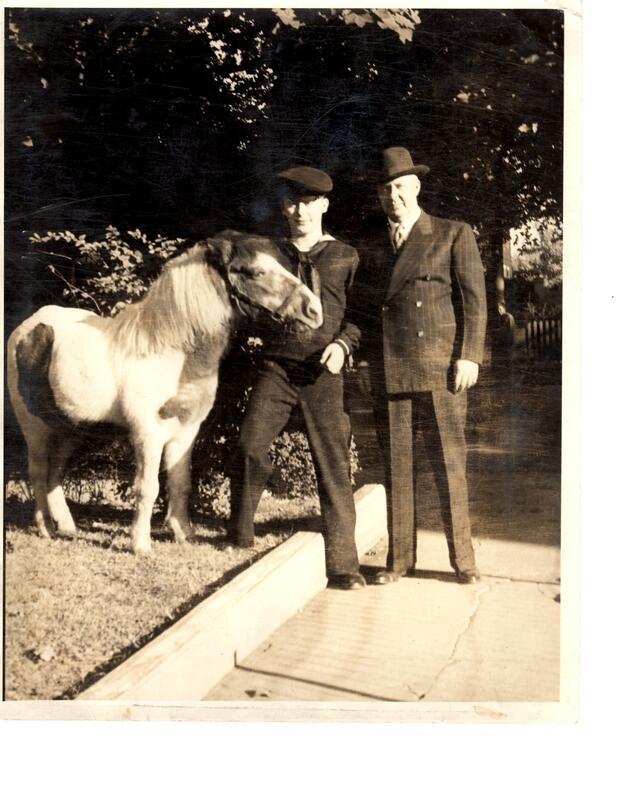 He stands between his beloved pony Bob, and his own father. My grandfather served in every station on the Passaic NJ police department from patrolman, Chief of Detectives to assistant Chief. The only years he took off from law enforcement in his adult life were 1917-1919 when he was a Sargent in the 78th division in France where he saw savage combat in the trenches. His only real wish in life was that his own son would not have the same experience. It didn’t come true, as my father went to both Korea and Vietnam. 2 Responses to Fathers Day – 2014. My father is my inspiration for building my Zodiac. He worked part time for an A&P on weekends (he was a steamfitter full time) and got the rebuilding bug. His first was a Taylorcraft, then a Waco UPF-7, a Luscombe 8A and a Fairchild 24C8C. I helped on the last two, becoming an airport rat nights and weekends. I got to spend a great deal of time with him and learned that a job is done right or not at all. He had built a shop in his back yard to rebuild a Waco UIC with my sons and I when he passed away. I have loved airplanes and flying since I was two years old riding in the canvas bag behind the seats in the Taylorcraft and looking out the window as we took off for a flight breakfast somewhere, then falling asleep to roar of the 65 Continental. He has been gone 16 years now, but those days at the airport with him working on airplanes in drafty shops and hangers seem like yesterday. When I was 18 my father offered to pay for flying lessons for me. It seemed kind of strange – He was a loyal Navy man; he was not a pilot nor even especially interested in flight, that I knew of. Anyway, life and circumstances prevented me from taking up his offer. It has been 14 years since he crossed over to his Reward; and now I find myself persuing this idea he planted almost a lifetime ago. Did he sense that somewhere inside of me slept a yearning to embrace the freedom of flight? Did he think that the self-discipline necessary to becoming a pilot would serve me in many circumstances of my then unfolding life? I can’t know what he was thinking that day, but lately I get misty thinking that at last I am fulfilling a dream he held out for me.